Sellers are clearly better off if their selling fees are lower. Here’s how eBay and Amazon differ on fees. eBay charges two main types of selling fees: an insertion fee when you create a listing, and a final value fee when your item sells. In addition, there are PayPal processing fees to consider. The insertion fee is charged per listing and per category, and is typically around $0.35. But if you have an eBay Store (eBay Shop in the UK), you get a free listing allowance every month. There are different Store levels available, starting with the Basic Store at $28 per month and 250 free listings, ranging up to the Anchor Store at $350 per month. The final value fee is a percentage of the final selling price. The percentage varies by category, but the typical rate is 10% on eBay.com and 9% on eBay.co.uk. You will also pay a fee to PayPal to process your payment. Standard PayPal fees are 2.9% of the selling price plus a $0.30 flat fee. eBay’s partnership with PayPal will end in 2020 and they have signed a deal with a new provider, Adyen. eBay says sellers should expect lower payment processing fees with Adyen. eBay also has several upgrades available to enhance your listings, such as the subtitle option. On Amazon, sellers are charged a monthly fee of $39.99 for a Professional Seller subscription. There are no listing fees for Professional Sellers, unless you have over 100,000 listings without recent sales. Referral fees vary widely depending on the category, but are typically 15% with a $0.30 per item minimum. Sellers also pay a closing fee of $1.80 on media items. There are no additional fees for payment processing on Amazon. Fulfillment by Amazon (FBA) has its own fees but we won’t be including those as eBay does not have an equivalent service. There is no clear winner when it comes to the fees charged by eBay and Amazon. eBay’s typical commission of 10% is lower than Amazon’s of 15%, but with PayPal fees the difference comes to only 2%. On eBay there’s also the potential for listing fees and additional extras, such as the subtitle upgrade, which you might need to compete effectively in some categories. Throw in the potential for higher monthly Store fees and the average eBay fees come so close to Amazon fees that the difference is negligible for many sellers. On an individual basis, the answer depends on your own circumstances including the products you sell, your typical selling price, and your sales volume. Seller performance standards are a good thing in general, but sellers are better off with less demanding standards that allow them to make a few honest mistakes without harsh penalties. Sellers who do not meet the first two performance standards, or have a very high rate of “item not as described” returns, are charged an additional 4% final value fee on sold items. In general, sellers who do not meet eBay’s performance standards (or its extensive listing policies) may have their accounts limited or restricted. The harshest penalty, a full eBay account suspension, is not common so sellers can usually continue selling on the marketplace and restore their standing in time. There are more stringent performance standards for eBay’s Top Rated Seller program, which can qualify sellers for a “Top Rated Plus” badge and a 10% discount on final value fees. Amazon takes seller performance extremely seriously and has stringent performance targets. When monitoring sellers’ accounts they consider all aspects of the customer experience including negative (one or two stars) seller feedback, returns, defects, cancellations and shipping targets. If these targets are not met, Amazon may notify the seller and allow them a time period in which to improve. If the seller does not improve, they can be suspended from selling. In some cases, sellers can be suspended without warning. There are many other scenarios, such as product quality issues and copyright complaints, that can also lead to seller suspension. Amazon account suspensions are common, and many sellers live in fear of them. Once suspended, sellers can appeal for reinstatement, but the process is difficult and opaque and it is common for appeals to be denied. Amazon’s performance targets and sanctions are tougher than eBay’s, without a doubt. Their penalties, particularly account suspension, are also harsher and are dealt out much more often. Ecommerce as a whole has made it much easier for shoppers to compare prices. That is really amplified on marketplaces, where multiple sellers offer exactly the same items side-by-side. Competition pushes prices down, which makes it harder for sellers to turn a profit. eBay does not make it all that easy to compare prices, because a search will often return a long and varied list of items. It’s down to the buyer to compare the listings by looking at the photos, titles, individual descriptions, shipping prices and so on. Even a search for a unique product, such as “lego set 31058” returns 254 results at the time of writing. Some are brand new and some are pre-owned, some are Buy It Now listings and some are auctions. Some listings are completely different products, combination packs or just an instruction manual. Then there are various prices and different shipping options. Comparing prices on eBay is easier than comparing different websites, but there’s still a substantial amount of effort needed if the buyer wants to find the very best price. Having said that, eBay buyers have a reputation as bargain hunters and might just enjoy the challenge of searching for a bargain. Amazon is a very different beast. It is driven by a product catalog, so each unique product should only have one listing. The catalog is not perfectly curated and can be abused, but one listing per product is the theory and the goal. The same search on Amazon.com for “lego set 31058” returns a variety of items but the actual set we are looking for appears only once in the results, right at the top, labeled with a reassuring Amazon’s Choice badge. When you click through to the product page you can see that there are 90 sellers offering this product, but only one seller in the “Buy Box”. If you are one of the other 89 sellers offering this product, and so don’t have the Buy Box, you are much less likely to get the sale. Amazon shoppers want the best price for products, but they don’t have to go hunting to find it – Amazon does that job for them. Even if they don’t want to go with the seller in the Buy Box, they can very quickly view all the sellers and choose the very cheapest. Amazon’s product catalogue allows buyers to compare prices very easily. Unless you win the Buy Box it is very difficult to compete with the other sellers. Having the most competitive price is a major factor in that. In November 2017 we wrote about eBay’s new Group Similar Listings feature, which is a move towards emulating Amazon’s Buy Box. This is still in testing and hasn’t yet been rolled out widely. Fees, performance standards and prices are important, but not all relevant unless you are bringing in a decent volume of sales. If you operate a healthy, competitive business with high standards of customer support, are you guaranteed to fulfill your sales potential on eBay? eBay’s search algorithms are notoriously flaky. It is often not clear why sellers rank where they do in the search results, and sellers find it hard to improve their ranking by changing their pricing, listing details, shipping speed or other factors within their control. Sellers often report that they bounce up and down in the results, meaning that their sales bounce around too. In addition, eBay operates selling limits, to try and ensure that sellers can meet customer demand and offer a good service. Accounts are reviewed monthly and selling limits automatically adjusted based on sales volume and customer feedback. The net result is that sales have to rise gradually. Despite eBay’s good intentions, inconsistent search rankings and selling limits tend to hold sales back. There can be a feeling that sales are spread thinly between many different sellers, rather than eBay allowing the best few sellers to rise to the top and get the lion’s share of sales. Amazon’s search algorithm and Buy Box algorithm are pivotal in determining sales volume. The factors which influence them are relatively clear and the rankings of results fairly stable over time. This means that sellers can sign up to FBA, adjust their pricing, build up product reviews and so on, and see their sales rise as a consequence. It’s highly competitive but not random – there’s a lot that sellers can do to increase sales. If a seller’s efforts result in a top search ranking for a popular keyword, and a firm grip on the Buy Box, sales can leap off the charts and never come back down again. Amazon also has a higher GMV than eBay, although around 50% of those sales are made by Amazon itself rather than marketplace sellers. Sales can be unpredictable and limited on eBay, while Amazon lets good sellers quickly grow a high sales volume. That’s as long as they continue to perform well and stay in stock, of course. Perhaps more average sellers would be better off on eBay, where the “sharing out” of sales might work in their favor. But this is about sales potential, and it’s pretty clear that Amazon offers an almost limitless ability to increase sales. An affordable, flexible and effective advertising program is a powerful tool for sellers to boost their sales. eBay has a relatively new advertising program called eBay Promoted Listings. The seller chooses which items to promote, and what percentage of the sales price they are willing to pay (typically 5-10%) on top of the final value fee. eBay then boosts their listings higher in the search results. Exactly where a promoted listing appears will depend on how much competitors are paying to promote their own listings. With Promoted Listings, the seller only pays when their item sells. This means that costs are known and can be planned for. On the downside, it is a fairly basic program with no control over when listings are promoted such as by specifying search terms. It’s just down to the percentage the seller is willing to pay. Anecdotally, eBay sellers report that Promoted Listings can be effective in bringing in additional sales at a predictable cost. Amazon has a mature and very popular advertising program called Amazon Sponsored Products. Sponsored Products gets items on the first page of the Amazon search results page for specific search terms. There are automatic and manual options, so sellers can allow Amazon to choose the search phrases they want to advertise on or choose them themselves. Sponsored Products is a cost-per-click program so sellers will pay every time their ad is clicked and will need to manage their campaigns to make sure they don’t overpay. Amazon Sponsored Products is a complex and sophisticated advertising program which has proven its effectiveness over time for many sellers. There are a growing number of software tools for managing Sponsored Products campaigns. Amazon has other advertising programs, including Sponsored Brands, which can be effective for advertising a range of different products from the same company. This was a close one. The two advertising programs look similar in that they boost listings up the search rankings, but under the hood they are really different. eBay Promoted Listings is easy to understand, has a fixed cost and reportedly works well. But it’s not a sophisticated program and it’s a little too early to say with confidence how effective it really is. Amazon Sponsored Products is much more sophisticated, and there’s no doubting its effectiveness. The learning curve is steeper but it has a lot of potential to deliver additional sales at an affordable (but variable) cost. It’s worth mentioning that due to the listing-driven nature of eBay, Promoted Listings is often used to promote products that are highly competitive (offered by many different sellers). Amazon Sponsored Products, in contrast, is typically used to promote products that only have one seller such as private labels or exclusive brands. How a seller gets their products to the customer’s door is arguably the most important aspect of selling online. 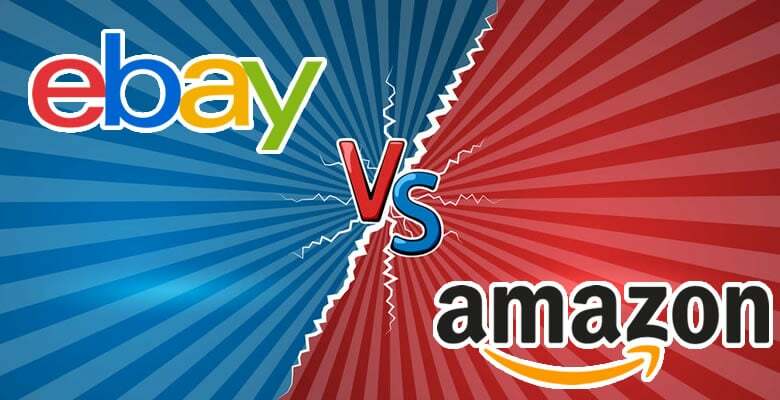 How do eBay and Amazon compare? eBay doesn’t currently offer any shipping or fulfillment services, apart from the Global Shipping Program, which is covered under International selling below. Sellers have to pick, pack and ship orders themselves, or find an independent provider who can do it for them. For a business who sells through other channels, and already has an order fulfillment operation, this may not be a problem. All they have to do is add eBay orders into the existing system. For sellers who don’t have that, they have to start from scratch or find a 3PL to work with. Amazon’s jewel in the crown when it comes to shipping and fulfillment is FBA (Fulfillment by Amazon), their industry-leading order fulfillment service. Businesses who use FBA send their products to an Amazon warehouse to be stored until sold. When a sale is made on Amazon, the product is picked, packaged and shipped to the customer directly from the FBA warehouse. Amazon charges fees for the service depending on size, weight, storage time etc., and FBA can also be used to fulfill orders from other channels (including eBay). For sellers, once their products are in the FBA system, Amazon deals with almost everything including any customer support messages relating to shipping. They’ll also strike out negative seller feedback that only relates to shipping problems. FBA also qualifies sellers for the Amazon Prime badge, which has a huge impact on winning the Buy Box. On the downside, FBA can be expensive. A middle ground option is Seller Fulfilled Prime (SFP). This is where sellers with excellent shipping operations of their own can apply to ship from their own warehouse, but still qualify for the Prime badge on their listings. The picture here isn’t quite as one-sided as it first appears, though. eBay’s lack of a fulfillment service means sellers have complete freedom to ship their own way. Amazon sellers often feel pushed into using FBA, because they can’t compete effectively unless they have the Prime badge on their listings. Having to use FBA alongside your own shipping operation can be a big headache for inventory management, and more expensive. But FBA remains an optional service, and a highly effective one too. As long as you have customers, you have to support them in some way – answer their questions, deal with returns and so on. How do eBay and Amazon compare? eBay started out as a person-to-person auction site, with a community feel and lots of back-and-forth chat. It still has something of that feel today, with a “Contact seller” link easily accessible on each listing. eBay buyers know that products and sellers can vary widely, and will often ask questions before committing to a purchase. Those might be about the product itself, discounts for buying multiple items, shipping and so on. They are also not slow to ask questions or complain about their order after they have received it. Buying on Amazon has always been a quick and clinical affair. Amazon customers want a fast, easy and convenient purchase. Perhaps they have more money than time, and less inclination to complain unless there is a serious problem. Whatever the reason, Amazon certainly doesn’t have a history as a chatty, community-driven marketplace like eBay. The design of the Amazon site discourages interaction between buyers and sellers, and it’s quite rare for a seller to receive questions from a buyer before they make a purchase. Buyers are much more likely to use the built-in product reviews and Q&A to get their information. When Amazon sellers do get messages, it’s usually because there is a problem with an order that has already been placed. If the seller uses FBA and the query is about shipping, Amazon will deal with that for them anyway. eBay buyers definitely have the reputation of being more demanding than Amazon buyers. They tend to ask more questions, both before and after sale, putting a much greater demand on sellers’ time. Selling to foreign customers can be a great way to increase sales without having to source new products. It quickly opens up a seller’s reach to hundreds of millions more buyers. eBay has 23 separate international sites and is used in over 100 countries. It has a true international system – you can register as a seller just once then sell through any eBay marketplace worldwide. It’s not unusual for eBay sellers to make international sales without even trying. eBay also has the Global Shipping Program (GSP) which allows sellers to ship an item for international delivery to a warehouse in their home country. The GSP handles international shipping, customs documentation, import fees and so on. The buyer is shown the full cost including international shipping and fees upfront, on the eBay listing itself. There is no fee to join the GSP, and sellers only pay for shipping to get the product to the warehouse in their own country, after the sale is made. It’s just like selling to a domestic buyer. Amazon has 14 international marketplaces. Sellers need to separate accounts to sell on each marketplace, with the exception of two “unified” areas in Europe and North America. A single seller account can be used to sell across the five European marketplaces, and a single account can be used to sell across the U.S., Canada and Mexico. Seller feedback is separate for each Amazon marketplace. Amazon has a similar offering to eBay’s GSP called Global Store. Products sold through Amazon Global Store are shown to buyers in their local currency with shipping and import fees included in the price. However, Amazon Global Store has a much lower site presence than eBay GSP. It’s hard to find without specifically looking for it. In terms of shipping and fulfillment, Amazon has good international “extensions” of FBA across Europe (European Fulfillment Network – EFN) and North America (North American Fulfillment Network – NAFN). These can help FBA sellers trade internationally, by getting their products close to buyers before they make a purchase. eBay has a greater global reach, a single international system and the Global Shipping Program, so wins this round. It’s a big advantage in business to have repeat customers. If buyers like you and your products, and you can contact them with offers, you’ll stand out against competitors and make more sales over time. eBay allows sellers to personalize their product pages. They have control over the design of listings, and can add their logo, information about their business, advice on the product, details of their return policy and more. eBay Stores also offers personalization options. Both for listings and stores, these branding opportunities have diminished over time with the growth of mobile shopping and eBay’s move to a more transactional marketplace, but they still remain available. Crucially, eBay buyers usually understand that they are buying from a specific seller and not eBay itself. eBay sellers package and ship their own products, giving them another chance to use branded materials and include marketing fliers. They can also contact past customers for marketing and repeat business opportunities. When customers buy from Amazon, they often don’t pay attention to who they are buying from – it could be Amazon itself or a marketplace seller. Some buyers don’t even realize that the marketplace exists, yet they buy regularly from marketplace sellers. Despite the advantages of FBA, it disguises even more the fact that there is a third-party seller involved. The customer’s phone number is only provided for delivery purposes. Sellers must never contact a customer using their phone number. Amazon do not provide real email addresses, only an encrypted version to enable emails to be routed through the Buyer-Seller Messaging service. Buyers can only be contacted with information about an order they have placed. Marketing messages are not allowed. Amazon sellers have no ability to personalize product pages, they only connect to a listing in the Amazon catalog. Amazon Storefronts, on the other hand, is a new feature which does provide some branding opportunities for small businesses. However, buyers usually find products by searching and are not all that likely to find a seller’s Storefront without being directed to it from an external site. Amazon does provide a great opportunity to sell your own unique products, and apply branding to those rather than to your business as whole. But sellers who do not have their own products have virtually zero branding opportunities on Amazon. eBay does not have a retail operation of its own, and allows sellers to create their own identity. On Amazon, sellers are close to anonymous. eBay buyers are your customers. You can show them who you are, and contact them relatively freely. There’s little opportunity for branding on Amazon, and they prohibit almost all contact with their customers. There are many different ways to be an online seller. A business which follows a conventional retail route, buying existing products from a wholesaler, is very different to one which sources clearance lines or has its own private label brand. How do the different business models fit with Amazon and eBay? Product reviews and stable search results that focus on products rather than listings are crucial to building a successful private label product, and eBay is weak in those areas. There are signs that this is starting to change, but for now eBay is not a natural choice for sellers with their own brands. Amazon is completely product-driven, with a strong review system. A wide range of products can be sold but there are restrictions on item condition so used products cannot be sold in many categories. Even sellers of new products can be asked for evidence that they were bought from authorized distributors. There are specific exceptions which can work well, such as used books. Amazon was more accepting of clearance and arbitrage models in the past, but the tide has now turned against those sellers. Why is it a draw, when eBay are a fit for more business models than Amazon? Because the business models that work on Amazon can work really well. They are more scalable than the models which work well on eBay. It’s particularly hard to scale used and arbitrage selling beyond a part-time business, while businesses with their own product lines can grow very large on Amazon. So it’s a draw… or is it? It’s Amazon that offers the most sales potential, and helps minimize effort with lower customer support volumes and the use of FBA. Profitability can be driven by higher sales, effective advertising and private label opportunities. It’s an unforgiving environment, but loved by its customers and incredibly successful. Amazon’s higher GMV and dominance of online retail, particularly in the U.S., is no accident. eBay, sadly, seems to be held back by its past. Some sellers will certainly find more success on eBay than Amazon, but on the whole it’s a marketplace struggling to adapt and evolve. That can be seen in eBay’s relatively flat GMV, technology problems and shareholder battles. I considered using Amazon rather than eBay but believe Amazon is focused on large purchases from China and individuals with more investment cash and the ability to hire outside help. EBay fits smaller sellers but in an effort to compete with Amazon it has become easy for buyers to steal. Ebays puts on constant seller pressure to lower prices, refund and treats sellers like the enemy. Nothing is perfect but I expect eBay to fail in its attempt to become Amazon. The net result will be the growth of other sites that don’t hate their sellers, like Bonanza, Etsy and Others. Amazon are incredibly arrogant and difficult to deal with. It is an ongoing fear that you will invest a great deal of money in to searching, purchasing and launching a product on to Amazon and have them suspend your account with out explanation. There are many sellers who have invested a great deal of money only to have their listing ‘hijacked’. Amazon need to become more respectful and supportive of sellers. Amazon beats ebay in every way. Anyone who doesn’t think so itsn’t a prime member. The bottom line is Amazon offers a VIP option that Ebay can only dream of. I pay for Prime every year, and year after year if ANYTHING goes wrong, amazon handles it. Credits, replacements, and even full refunds. Ebay is the poor mans marketplace. No VIP option, horrible shipping, horrible service, and if something goes wrong, get ready for a fight. As a prime member I am always right. One call and everything is taken care of. No fight, no BS. You know why? Because the customer is always right. Even when they are wrong.